on the fabulous Sunshine Coast. We strive to make your holiday enjoyable! 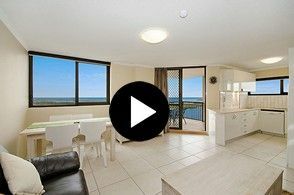 Banyandah Towers Apartments, Maroochydore offer 15 storeys of value holiday accommodation on the tranquil Maroochy River (just perfect for boating, fishing or simply letting the world go by). Relax in our 2 bedroom holiday accommodation units with ensuite plus separate bathroom, separate laundry, fully equipped kitchen with dishwasher and microwave; balconies with superb river and some with ocean views. Enjoy a few days, a week or even a few months stay. All units do not have air conditioning. We cater for couples, families and groups. Banyandah Towers prides itself on a comprehensive range of golf packages, offering discount rounds at all the leading Sunshine Coast courses including the Palmer Coolum Resort, Noosa Springs and Twin Waters. Our outdoor swimming pool & spa, which sit on the edge of the river, is heated all year round. A games room with a pool table & games machines as well as a fully stocked vending machine is available for your enjoyment. Also located in the games room are the male & female saunas. Wi-Fi Internet is available. (charges apply).